We invited companies across the U.S. to take part in our rigorous, nearly 90-question survey. Not every company that responded made the cut. 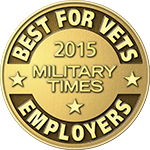 Rankings were developed based on the answers that companies provided to questions about their recruiting of people connected to the military; company policies related to veterans, reservists and their families; and the organization's culture. Not everything listed in this chart was considered in the rankings, and many items not listed were considered. contributions Sick days Vacation days Do activated or drilling reservists receive their full civilian pay or the full difference between their military and civilian pay? And for how long?